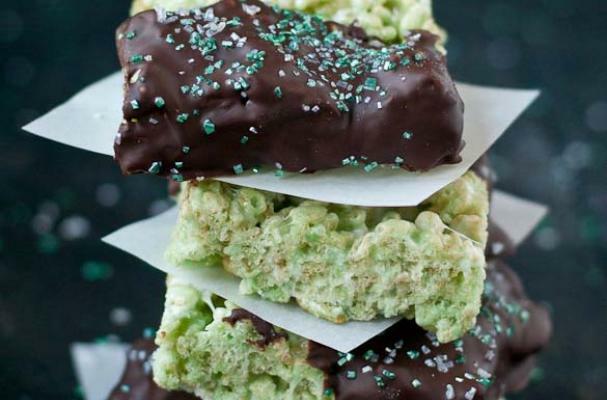 Mint chocolate Rice Krispy Treats from Neighbor Food are an easy St. Patrick's Day snack. Rice cereal is combined with marshmallows, peppermint extract, and green food coloring to turn this ordinary snack into one that is fun and festive. Once the Rice Krispy Treats have set, they are dipped into chocolate and sprinkled with green sanding sugar. This dessert can also be gluten-free, just make sure to use gluten-free rice cereal. For full recipe instructions, click here.